Quick overview This popular book provides practical guidance for healthcare professionals wishing to reflect on their work and improve the way they undertake clinical procedures, interact with other people at work and deal with power issues. 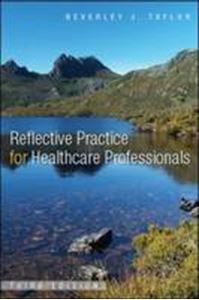 "This detailed, practical guide to reflective practice has relevance to all healthcare practitioners. Taylor offers readers her REFLECT model to guide them through the process of reflection...Throughout she uses a wide variety of techniques to explain and illustrate what to expect and how to adapt and accommodate to different circumstances and preferences...This book has such depth and detail and yet at the same time is practical and written in plain language. There is literally something for everyone..." Canadian Journal of Occupational Therapy, April 2011 78(2) "Taylor reveals how reflection and contemplation creatively welds the everyday working day world to a myriad of cultural, ethical, moral and managerial challenges. This book offers the beginning practitioner a broad understanding of why conscious awareness of one's thinking matters. Taylor's insight reveals her deep thoughtfulness as a meticulous researcher, supervisor and mentor and her guidelines will ground you in shaping your own development as a researcher in practice." Dr Margaret Martin, Victoria University of Wellington, New Zealand "Reflection, as a process of critical self-evaluation, continues to grow and be recognised as a successful,approach to improving, changing and managing healthcare practice. This latest text by Taylor is a welcome addition to the increasing body of knowledge on the subject. She writes, as always, with exceptional clarity and manages to combine practical guidance with experiential insights and theoretical frameworks. Highlighting the importance of ordinary human communication for all healthcare professionals, Taylor's text and presence is anything but ordinary." Professor Dawn Freshwater, University of Leeds, UK "This book is about more than reflection, it is about a philosophy of nursing that Taylor has espoused throughout her career, and it makes a connection with the reader in a way that many books do not.This is a must-have book for all who wish to move their practice forwards." Joanne Pike, Senior Lecturer, NEWI, North Wales This popular book provides practical guidance for healthcare professionals wishing to reflect on their work and improve the way they undertake clinical procedures, interact with other people at work and deal with power issues. The new edition has been broadened in focus from nurses and midwives exclusively, to include all healthcare professionals. Practice stories by a variety of healthcare professionals are interweaved throughout the book to illustrate reflective practice and 'author's reflections' boxes are used to illustrate the author's experience of reflective practice. The book contains a clear and comprehensive description of: The fundamentals of reflective practice and how and why it is embraced in healthcare professions Strategies for effective reflection Systematic approaches to technical, practical and emancipatory reflection A step-by-step guide to applying the Taylor REFLECT model This edition also introduces the concept of 'ordinariness' in health care, which used consciously with the reflective practice processes in this book should increase the likelihood that patients receiving healthcare will feel acknowledged, heard and comforted as intelligent human beings.